This entry was posted in Public Programs, Riverfront News on July 30, 2016 by riverfrontcoordinator. Just five years ago when Newark Riverfront Revival began its work, there weren’t too many reasons to visit the water’s edge of New Jersey’s greatest city. But things have changed! In 2014, over 3000 Newark residents & visitors came to relax, socialize, dance, perform, eat, explore, cheer & watch the river roll! 2014 also marked serious steps towards cleaning the river & expanding public access to it. In April, the EPA Regional Administration came to the Orange Sticks to announce the federal government’s proposal for cleaning eight miles of the Passaic River. Newark’s first public riverfront access outside of the Ironbound opened with a first stretch of Downtown Riverfront Trail between Penn Station & Cherry Street. PSEG’s remediation of the former Market Street Gasworks continued, setting the stage to open another segment of riverfront meadow near Raymond Boulevard & Prospect Street. Finally, the City of Newark, Essex County & Trust for Public Land advanced work on Segment 3 to begin construction in 2015, which will better connect the sports fields near Brill Street to the Orange Boardwalk & expand under the Jackson Street Bridge & beyond. All of these good things from house parties to park construction to river remediation have only been possible because Newarkers & others have taken a stand & gotten involved in creating the riverfront that Newark wants. Going forward, we look forward to attracting every Newarker to the river’s edge & beyond! Please help us accomplish our goal by visiting our new website at newarkriverfront.org, signing up for our email list, following on Twitter, liking on Facebook & talking with your friends & neighbors about our river. See you all down by the water in oh-fifteen! See the rest of Newark Riverfront Revival’s 2014 in review! This entry was posted in Building Things, Public Programs, Riverfront News on December 26, 2014 by NRR. Newark Riverfront Revival (NRR) aims to connect every Newark resident to their river. Since 2008, NRR has built the constituency for Newark’s riverfront by taking hundreds of people on boat and walking tours, hosting concerts, dance parties, a gospel festival, dozens of outreach events, design education programs for youth, and a City Hall exhibition. Since 2012, NRR has worked with Essex County, the City of Newark, Ironbound Community Corporation, Friends of Riverfront Park, The Trust for Public Land, and other partners to build and program over 15 acres of riverfront parks, including a walking and biking trail, sports fields and courts, floating boat dock, riverfront boardwalk, playground and other settings for relaxation, picnics, exercise, and environmental education. In 2014, with major support from the National Endowment for the Arts Our Town Program and others, NRR organized 63 events June through September engaging thousands of people. NRR pursues a broad vision of environmental justice for Newark residents and others in seeking to build a riverfront that reflects, nourishes, and sustains the city’s deepest traditions and diverse population. NRR especially seeks to increase the participation of historically marginalized people in decision-making about the future of Newark’s riverfront. The Program Director will be responsible for supervising all aspects of the organization and will have primary responsibility for program development and fundraising to support and grow the organization’s $110,000 budget. The Program Director reports to the Newark Planning Director and Ironbound Community Corporation, Newark Riverfront Revival’s fiscal agent. NRR has reached a critical point in its development and is poised to achieve its mission in new and broader ways. The ideal candidate for Program Director will demonstrate the vision, understanding, modesty, ingenuity, and hustle to take these efforts to a next level. —Oversee development and execution of programs and projects in pursuit of NRR’s mission, including Newark boat tours, walkshops, concerts, physical fitness classes, movie nights, festivals, and more Responsible for overseeing performers/facilitators, equipment, publicity, logistics, etc. Please submit your resumé and cover letter by August 29, 2014. Your cover letter should discuss how your education, training, work experience, and vision will complement NRR’s need for leadership and innovation. Please include the names and contact information of three professional references, and your salary history and expectations. Download job description & application instructions. This entry was posted in Building Things, Public Programs, Riverfront News, Youth Education on August 15, 2014 by NRR. 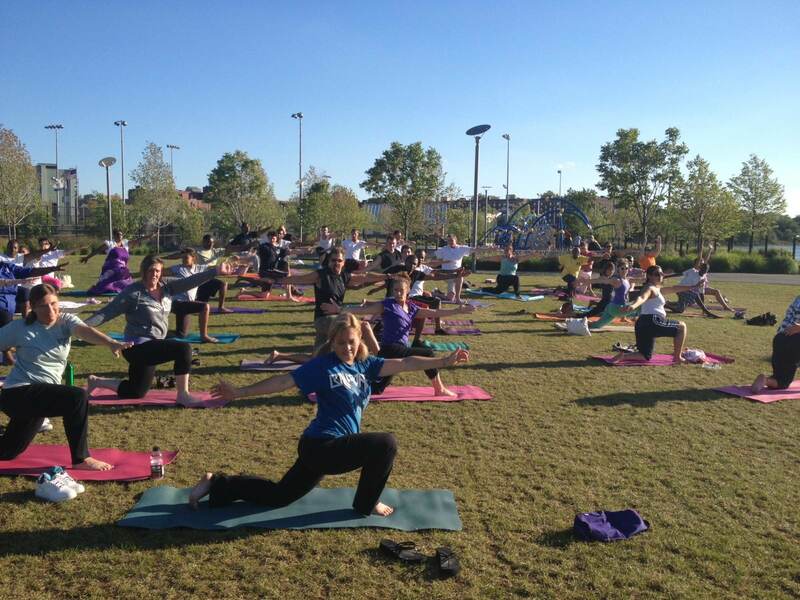 Free Public Riverfront Yoga & Zumba! 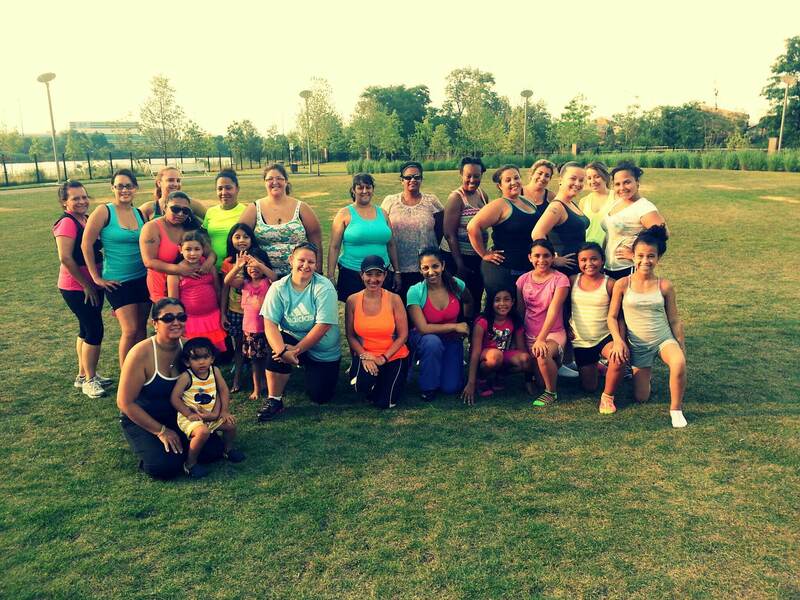 June through September 2014, Newark Riverfront Zumba & yoga classes will fill the Meadow at Essex County Riverfront Park with life and energy. On Mondays, stretch out with Newark Yoga Movement . On Tuesdays, work it with Zumba instructor Sue Campbell. Riverfront Yoga, 6-7 pm at the Riverfront Meadow (Enter park at Raymond Blvd and Brill St, take right and circle around to the Meadow.) Bring a mat or blanket. Free & open to the public. Riverfront Zumba, 6-7 pm at the Riverfront Meadow (Enter park at Raymond Blvd and Brill St, take right and circle around to the Meadow.) Free & open to the public. This entry was posted in Public Programs, Riverfront News on June 13, 2014 by riverfrontcoordinator. 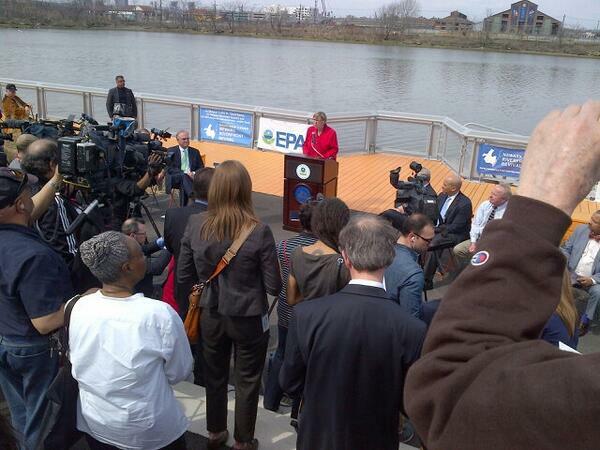 On April 11, 2014, at Newark Riverfront Park’s Orange Boardwalk, the US Environmental Protection Agency announced its long-awaited cleanup plan for the lower eight miles of the Passaic River. The proposal includes bank-to-bank dredging of the river and the removal of 4.3 million cubic yards of contaminated sediment. As per Superfund law, the clean-up will be funded by the companies responsible for the pollution. Newarkers and others have advocated for the river clean-up for decades; this announcement brings the dream of a clean, safe, and healthy river another step closer to reality. On Wednesday, May 7, the US Environmental Protection Agency will hold the first of three public hearings on the proposed clean-up of the Passaic River. All are invited to learn more about the proposed clean-up and offer their thoughts and feedback to the federal government. The hearing will begin with a brief presentation by the federal government followed by spoken comments from the public, which will be limited to two minutes. EPA will also accept written testimony. For more information please visit ourpassaic.org. Everyone who cares about the future of the Passaic and its neighboring communities should attend! “Massive, $1.7 billion environmental cleanup of Passaic River proposed by EPA,” Star-Ledger, 4/11/14. “A Cleanup Plan for a Toxic River,” New York Times, 4/15/14. This entry was posted in Riverfront News on May 7, 2014 by NRR. Newark, NJ –Mayor Luis A. Quintana, the Newark Municipal Council, Planning Director Damon Rich, Newark Riverfront Revival, Essex County, Ironbound Community Corporation (ICC), and The Trust for Public Land announced today that New Jersey Future has selected Newark’s River: Redevelopment & Public Access Plan and Newark Riverfront Park as one of its 2014 Smart Growth Award winners. The City of Newark was one of eight communities to receive the coveted award. The construction of Newark & Essex County Riverfront Park and the adoption of the Newark’s River: Redevelopment & Public Access Plan were both recognized for demonstrating and advancing smart growth principles. These achievements, the culmination of 20 years of advocacy and planning, grew from sustained partnerships between public and private stakeholders. These partners came together to connect Newark with its river, to grow the city and its neighborhoods to the water’s edge, and to bring the life of the city to the amazing natural attraction at the heart of the region’s most populated place. On August 3, 2013, Newark’s second segment of riverfront park opened to the public, featuring a bright orange boardwalk fabricated of recycled plastic lumber. Bringing Newark’s riverfront park area to a total of 15 acres, this opening occurred 20 years after the lower 17 miles of the adjacent Passaic River were declared a Superfund site. As accompaniment to the development and adoption of the Newark’s River: Redevelopment & Public Access Plan a few days later,these parks gave material evidence of Newark’s riverfront revival and also demonstrated strong application of smart growth principles. The announcement of the award comes just in time for the launch of the 2014 Newark Riverfront program calendar next month. Organized programs include free and low-cost activities like concerts, boat tours, kayaking, environmental workshops, movie nights, public art, youth day camp, and public exercise that are set to draw Newarkers and visitors to the City’s riverfront. Learn more at www.newarksriver.wordpress.com. New Jersey Future is a nonprofit, nonpartisan organization that brings together concerned citizens and leaders to promote responsible land-use policies. The organization employs original research, analysis and advocacy to build coalitions and drive land-use policies that help revitalize cities and towns, protect natural lands and farms, provide more transportation choices beyond cars, expand access to safe and affordable neighborhoods and fuel a prosperous economy. Newark Riverfront Revival (NRR) aims to revive Newark’s riverfront to bring concrete benefits to the City of Newark and its residents. Since 2008, NRR has built support for Newark’s riverfront by taking hundreds of people on boat and walking tours, hosting dozens of outreach events, organizing design education programs for youth, and staging a City Hall exhibition. Since 2012, NRR has worked with Essex County, the City of Newark, The Trust for Public Land, Ironbound Community Corporation, and other partners to build and program over 15 acres of riverfront parks, including a walking and biking trail, sports fields and courts, floating boat dock, riverfront boardwalk, playground and other settings for relaxation, picnics, exercise, and environmental education. This entry was posted in Building Things, Riverfront News, Rules for Development on April 7, 2014 by NRR.